Action, RPG has a very broad spectrum. It doesn't have to be a Diablo clone to be a Action RPG. Grid inventory and isometric view are just one Style of an action RPG. Borderlands, Skyrim/Fallout and Darksouls are also considered to be Action, RPGs. Last edited by Robviously; 01-10-2016, 02:46 AM. What you are talking about is simply the UI layout and that has nothing to do with an inventory system, items or game mechanics. An Action RPG is a very broad genre. For example Skyrim/Fallout 4 are action rpgs because they have a strong emphasis on combat. You could switch this Demo UI to be a Fallout/Skyrim item list, or a Jigsaw grid layout like Diablo, or a position in a bag layout like oldschool Darkfall/Ultima Online with almost entirely only making UMG UI changes. But that is assuming the person has some level of knowledge in UE4 and development. It should be pretty straight forward for people with some experience blueprinting in Unreal. I will be creating a tutorial series after the launch of the TopDown Kit to show how to integrate the two. Last edited by Pirate; 01-10-2016, 04:20 PM. Seriously can't wait to try this one. Looks to be extremely easy to integrate into a project. Cheers guys! If games were categorized like music, you would (basically) be saying this is Rap instead of Hip-Hop because there's a snare. When, in fact, most genres of music use a snare in every song. When it comes to RPGs, MMOs and ARPGs are mostly the same thing. When you really get down to it, it's how you handle everything that changes the style. Last edited by MΚ ULTRA; 01-10-2016, 05:59 PM. w/ the demo content into a Multiplayer TopDown Kit project. with all the extra demo content into the Multiplayer TopDown Kit before the launch of the MP TopDown Kit. This all looks so awesome! Keep it up!! I am very excited about some upcoming projects we are working on and can't wait to share those as well. I'm part of a project of creating a survival game and we were looking into inventory system. We're wondering if there will be a way for players to loot items off a ''character like'' inventory instead of a container type inventory. Going through the replies i came across: Additionally a Player is also given the Inventory Manager Component which allows the player to interact between his inventory and the inventory of any actors in the world. But im wondering if this can be set to dead players / pawns. We would like to be able to kill someone then go loot it and see exactly what his character was wearing and in which slot ... Think this could be possible with your system? We already saved up the bucks for jan 27th ! This seems to be the most complete beginner friendly inventory system so far. im pretty sure we wont be disapointed and were gonna save tons of hours with this. In the demo examples there is no player looting but there are plenty of ways you can have the player character become loot-able on death. One way you could easily do it, is to move the Equipment Inventory Component to the Player Character instead of having it in the Player Controller (but keep the Inventory Manager Component on the Player Controller) and have it so the players body can be used by players when dead like any other usable container item. This would allow you to view it like a container and interact with it's items. You can easily create a new Loot UI specifically for players to display where the items are equipped and when you loot an equipped item have it update the corpse to remove the mesh showing you took that players jacket, helmet, weapon, etc..
After taking a bit of time to understand the system it should be very straight forward to customize it and add additional features for your own projects specific needs without too much work. There are no container in container examples in the demo content and that would take a little bit more work to build depending on how you want it to work. You could create a new item type that's a container and make it so that the item has a reference to it's own inventory and when used in the inventory it opens a container window. Last edited by Pirate; 01-18-2016, 08:47 PM. How do you currently do it with NPCs then? Do they drop a container, or is it just simply a different call since it's not a player controller? The demo examples use the normal Inventory Component on the loot and storage actors. The storage examples show how to use the same Inventory Component to store and retrieve items from an actor. The Equipment Inventory Component derives from the Inventory Component and sets the first X amount of inventory slots to be the equipment slots based on how many equipment slots you have configured in the system. When one of these equipment slots is changed in the inventory it will update the characters visually equipped item mesh for that slot. It's a very trivial change if you want your NPCs to wear items and have their inventory behave like a players. You could just assign a Equipment Inventory Component to NPCs instead of the normal Inventory Component. That way you can make it so the NPCs wear the items in their equipment slots in the inventory just the same as a player would if they both use character that inherits from the Equipment Character blueprint. Or you could easily create your own child component for NPCs if you only want NPCs to have a few equipment slots instead of all the ones a player has. I really hope that doesn't sound complicated because it's not at all. The strength of the system is that it is clean and powerful multiplayer supported foundation to build upon. Everyone has their own game design and ideas and you can't build a system that fits perfectly with everyone's specific game design. The Inventory System assumes some level of experience in unreal and blueprints. If you have some basic knowledge and understanding of how unreal works it will be pretty straight forward to build upon this system and make any changes your game might need in an inventory system. Also as mentioned before the included demo examples just show one way to do things with the system. You don't need to use the demo examples as provided, feel free to make changes to them to fit your project. Last edited by Pirate; 01-18-2016, 08:50 PM. It doesn't sound too complicated. I definitely do want our NPCs to have equipped items, but my original question was more about if a player kills that NPC, what can he loot from it (especially if the NPC had equipped items)? Just wondering what the out-of-the-box process is for looting NPCs. I was originally thinking you might be doing something like when the NPC dies, he "drops" an inventory (like a bag on the ground similar to older top-down adventure games). Or would players loot the actual NPC character? It sounds like these are examples I can open and look at. Did I miss something and you're on the marketplace already? Or are you just describing that once its listed on marketplace I can check those examples? Hey Zooch, It is not on the Marketplace yet (Jan 27th) I simply meant they are working examples to learn from when you have it. In the demo there is no combat so the NPCs on the ground are simply static actors with inventories. They demonstrate how to interact with actors that have inventories. 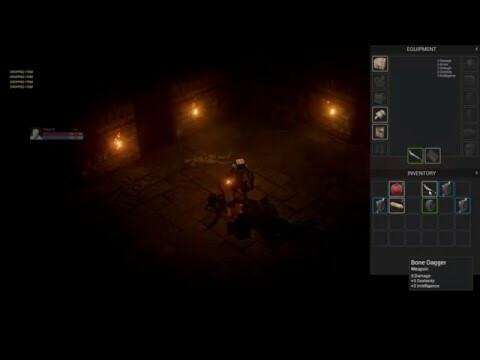 You can see in the video of the Inventory System merged with the Multiplayer TopDown Kit that the player is looting from the Zombies when they are dead. If you want an NPC to have all it's items and equipment lootable that's out of the box behavior. If you don't want everything they have to be lootable you can set set it up so they drop loot from a list or maybe randomize what items they have that they drop. It's really up to your design and won't be limited by the inventory system. Setting up an NPC to be lootable when dead is as simple as giving that actor an inventory and making the OnActorUsed function to access the inventory only work when the NPC is dead. If you wanted to drop a 'bag' on death instead of making the corpse interactable it would be as simple as creating a 'bag' actor that you spawn on death that has an inventory with items pulled from a loot list or loaded from the NPCs inventory. The examples in the demo content will show you how easy it is to build the behavior you want. It doesn't include a player looting demo because the majority of games will have inventory that persists through death and setting it up yourself is pretty straight forward with the system. When the Inventory is released I will requesting suggestions for new demo examples people might like to see in future updates. Pirate i didnt read a word about the price? How much? And how big is the filesize? How is it to implement? Can you show how you build it? 3.) I think it is easy to implement and I will be showing a video on how to merge it with the Multiplayer TopDown Kit. That will give a good example of how to implement it into your own projects. 4.) It is build very clean and very solid this makes it extremely expandable. The only limit is your willingness to learn and create. 5.) There is a video showing how to add new items and with the video that is coming soon to implement it into the MP TopDown Kit I think these show off enough of the system without giving it all away. Last edited by Pirate; 01-18-2016, 09:31 PM.